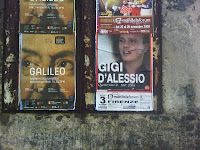 Last June, when tickets to the Gigi d'Alessio concert went on sale, I was probably the first buyer. I bought the two best seats in the house. So, I had a whole six months to find a sincere, passionate man who also likes Gigi D'Alessio who would enjoy the concert with me. I figured this would be an ample amount of time. Little did I know that everyone over 30 years old who lives north of Napoli has an instinctive hatred for Gigi d'Alessio. Why? Is he too romantic? Too melodic? Too dreamy? Too Napoletano? As the countdown approached, I realized that I would have to invite someone who is neutral on Gigi D'Alessio, let loose at the concert, have fun and enjoy. Which I did. I invited Leif, my good friend and fellow bike addict. Speaks Italian well, but isn't. I made dinner at my place first and then we rode our bikes to the Nelson Mandella Forum. Gigi was great. As I sang my heart out, I thanked God for my passion. It's what saves me. Let it never end.